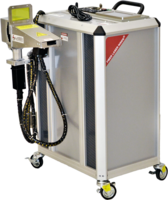 Orlando, Florida, Nov 09, 2018 – Laser Photonics has been featured in a Thomas Net press release for their cleaning equipment. The CleanTech Handheld LPC-200CTH Cleaning Tool is suitable for industrial applications such as nuclear power energy holding tanks, injection molds, food processing and cosmetics equipment, power turbine generator components. The product uses multiple sweeping patterns to eliminate unwanted overlapping finishes. It is classified as Class IV laser instrument.